Weather and climate have an impact on air quality through controls over heating needs, transport and diffusion of pollutants in the atmosphere, and chemical transformations. Looking generally at the climate of the FSU, its most distinctive feature is undoubtedly low winter temperatures. Throughout most of the region demands for domestic and workplace heating in winter are extremely high and combustion in power plants and domestic furnaces is bound to be a very (and often the most) important source of pollution. It is a basic fact of air pollution meteorology that even if emissions in a given area remain constant, air quality can vary dramatically with changing weather and the ability of the atmosphere to transport, disperse, transform, and remove pollutants. After release, the dispersion of pollutants is controlled by atmospheric movements which in turn depend on wind speed and the vertical distribution of temperature. Wind speed is critical with respect to horizontal transport of pollutants while wind speed and temperature stratification combined control the vertical movement of pollutants and the depth through which pollutants are mixed (mixing depth). In the most general terms, when the atmosphere is windy and unstable, pollutants are mixed through a considerable depth and their concentration decreases, whereas when the air is calm and stable, pollutants accumulate near the point of emission and pollution levels build up (Lyons and Scott, 1990). The atmosphere is stable when temperature increases with height. This condition is known as temperature inversion. Temperature inversions can develop near the ground (ground-based inversions) or at a height (elevated inversions). With regard to air pollution, the worst conditions occur when ground-based or low-level elevated inversions accompanied by calm weather persist for a long time. These conditions are associated with anticyclonic weather in winter when clear skies enhance radiative cooling of the earth surface. Between November and March, a large part of the FSU is dominated by the Siberian anticyclone (a stationary area of high pressure centred over northern Mongolia or Southern Siberia) whose influence extends well into the European territory, Kazakhstan and Central Asia. 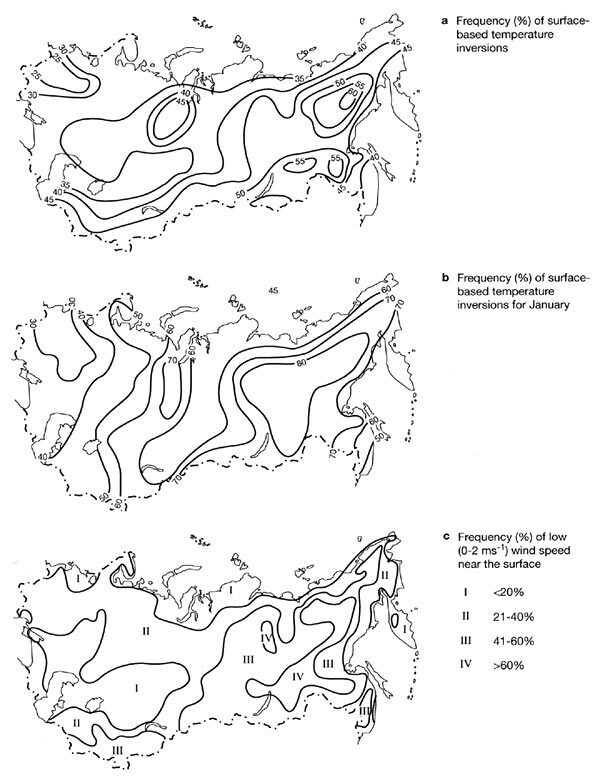 In January, anticyclonic weather in Central and Eastern Siberia is observed on 20-27 days and the frequency of the ground-based inversions combined with low wind speeds is extremely high (Figure 21.1). While in the European territory and in Western Siberia temperature inversions only occasionally persist for a few consecutive days, further east they remain intact for weeks, extending up to a height of 500-800 m. Under this condition, known as atmospheric stagnation (Holzworth, 1974), the dispersion of pollutants emitted by various and diverse sources is suppressed, leading to higher pollution concentrations than would otherwise be experienced. Using stagnation data, meteorological potential for air pollution has been evaluated for the FSU (Bezuglaya, 1980). 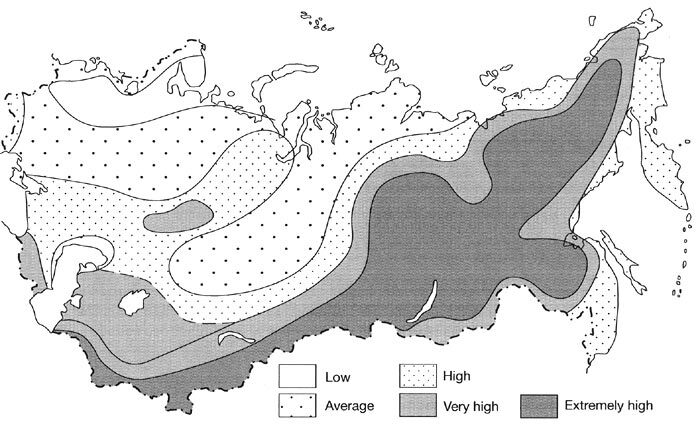 Areas with high and extremely high air pollution potential with regard to low elevated sources account for about 40 per cent of the territory, including the industrial regions of Kazakhstan and Southern Siberia (Figure 21.2). The definition of unfavourable atmospheric conditions depends on the relative amounts of emissions from low elevated and tall sources. The tall-chimney policy, adopted in the 1970s, has been implemented widely throughout the FSU and in many cities, especially in the European sector where central heating is used, the height of chimneys varies between 50 m and 200 m. The tall chimney emissions, which have a high temperature and velocity of effluent gas, penetrate all but perhaps the strongest ground-based temperature inversions. The unfavourable atmospheric conditions occur when elevated inversions develop and act as a 'lid' above the plume. This prevents its upward dispersion and causes either fumigation of the ground or accumulation of pollutants in the inversion layer. Should elevated inversions persist, causing pollution to build up aloft and then be eroded, their contents will be brought down to the ground in the process of convective mixing. Such conditions lead to an increase in pollution levels lasting up to a day and affect areas many kilometres from the source. This process, typical of many mid-latitude cities worldwide, occurs frequently in the European part of the FSU in winter where the frequency of elevated inversions, associated with slow-moving warm fronts, exceeds 40 per cent (Bezuglaya, 1980). For example, Moscow, the largest FSU city, accommodates many large power plants with tall (100-250 m) chimneys. Emissions from the power plants, which are the largest individual contributors to pollution by nitrogen oxides, are trapped within the inversion layer for a few days and, when photochemically aged air finally descends on the city, nitrogen dioxide (NO2) concentrations exceed the safe daily guideline of 150 mg m-3 recommended by WHO (Shahgedanova et al., 1999).